Challenges are bound to happen, but how one responds to them is what matters most. 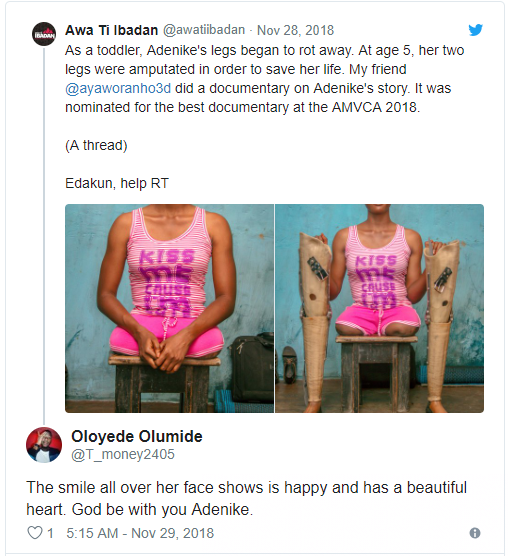 A Nigerian lady named Adenike has shown that in spite of the very problematic situation she is passing through, she intends to overcome and achieve the goals she has set for herself. This lady is an amputee whose both legs have been taken out due to a health crisis she faced when she was still young. 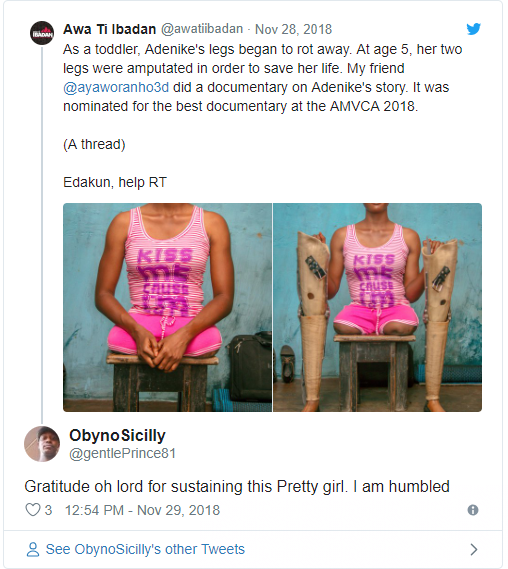 As gathered by Legit.ng, Adenike started battling with rotten limbs when she was five years old. In order to save her life, the doctors had to amputate her both legs. 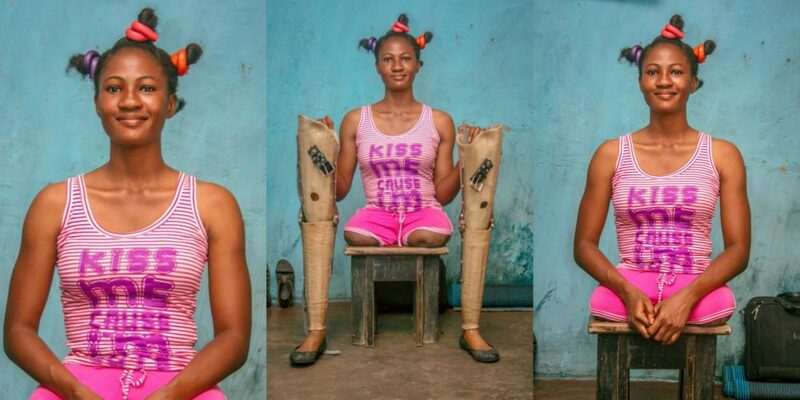 Ever since, the beautiful lady has been using a pair of prosthetic legs to aid herself in walking. Despite this challenge, Adenike made up her mind that she will still pursue her education to whatever height she deems fit. 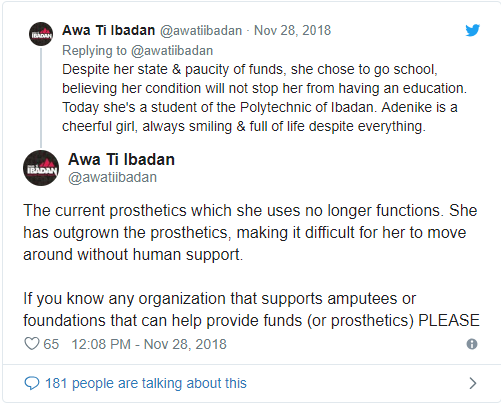 In respect to this, she has gone through all the phase of schooling, and now, she is in Ibadan polytechnic. 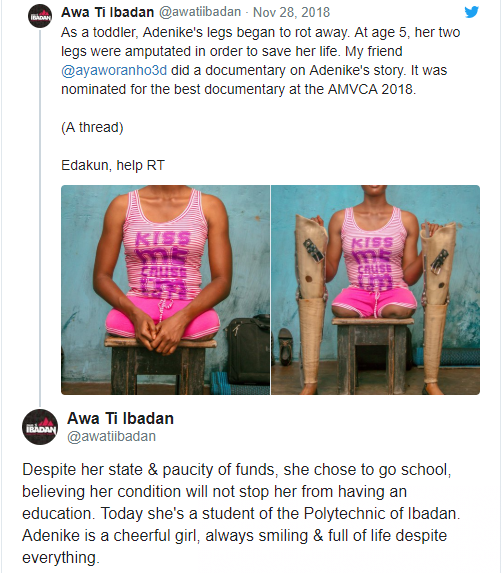 The story of this inspiring lady was shared by a Twitter user named @awatiibadan. The person or group of people was very challenged by how Adenike has continued to lead her life in spite of the challenge she is facing. As highlighted by the person, a documentary of the lady was done by a filmmaker and this won a nomination during the Africa Magic Viewers Choice Award. After introducing Adenike, @awatiibadan went on to talk about how inspiring the girl is and how she has managed to live above the challenges she is facing in life. Even more, the current challenge she was facing with regards to her prosthetic legs was also talked about. 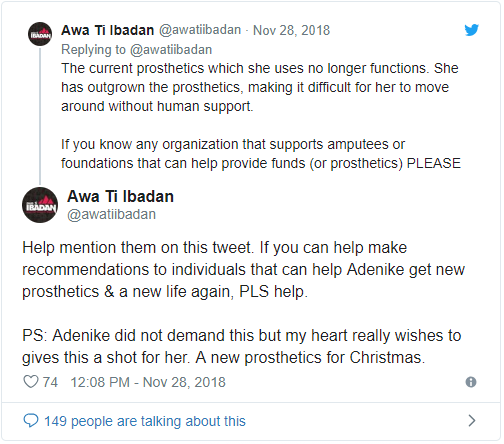 According to @awatiibadan, Adenikes’s artificial legs had already outgrown her, and thus, she was having difficulty moving around without the help of people. 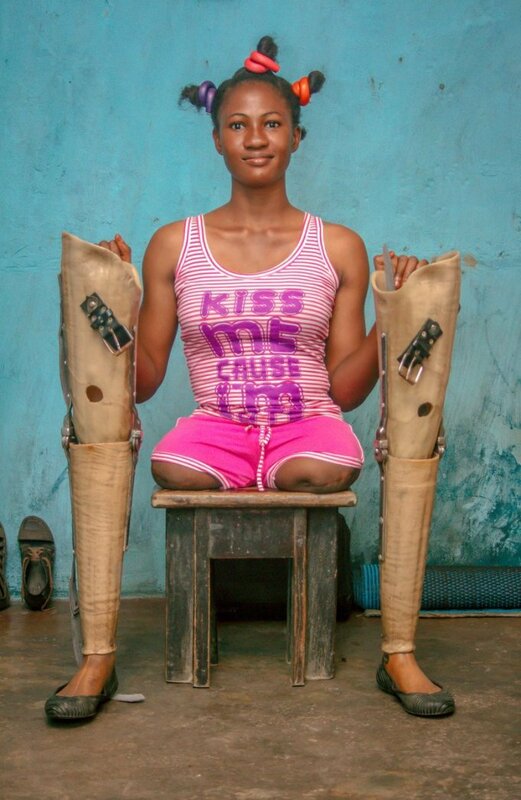 A request for people to help her with obtaining a new pair of prosthetic legs was also made. 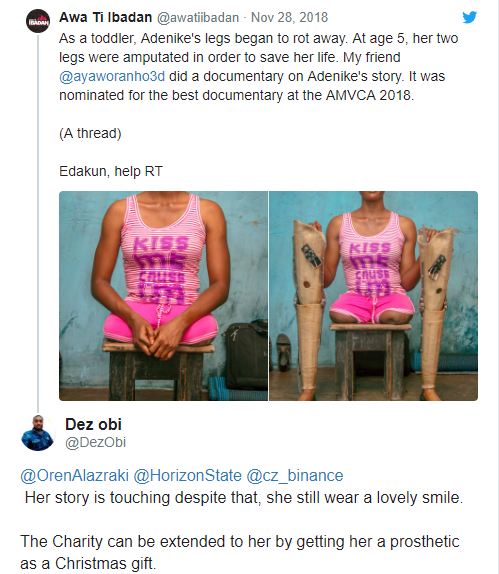 Many Nigerians have indeed been moved to compassion with the story of this young lady. Their heartfelt sentiments towards her were reflected in their comments. Just a while back, we shared the story of an amputee who is stealing the hearts of many. The beautiful lady is living her best life in spite of the fact that she has lost her limbs. This is inspiring.